I’ve known this has been a problem for quite some time but have just chosen to mostly ignore it. I think it’s now time to address the problem of subscribers forwarding the nightly reports. Realistically there’s no way to police this kind of theft, and if you just want to forward one or two reports to a friend so they can sample the SMT I have no problem with that. I do have a problem when someone copies the report and forwards it to 20 of his investing buddies though. I think we can all agree that the price of the newsletter is chump change, especially compared to the profits we made last year or even so far this year for that matter. I’ve kept the cost of a subscription down to a reasonable level to where virtually anyone can easily afford a yearly subscription. So price really shouldn’t be an issue. So here’s what I’m going to do. I’m going to give everyone an incentive not to pass on the reports freely. I’m going to rebate $50 for every friend or associate you send to the SMT that signs up for a yearly membership. If you sign up 4 people your membership for the year is free. If you sign up 8 people not only is your membership free but you will make $200 (go buy some silver Eagles). They have to sign up for a year. They will need to tell me at the time who referred them and give me your email address so I can deposit the funds in your Paypal account. There will be no limit to how many people you can refer but I’m not going to try and keep track of this on a yearly basis and I’m not going to do retro rebates. The program will begin today. It’s just going to be a one time rebate of $50 whenever you refer a new subscriber for a yearly membership. Hopefully this will be enough incentive to cure this problem. This entry was posted in Uncategorized on February 25, 2011 by Gary. The last bear market was triggered when the credit bubble created by Greenspan’s foolish monetary policy burst. It was exacerbated by Bernanke’s foolish attempt to debase the currency and reflate the bubble. All he succeeded in doing was to inflate oil to $147, which put the finishing touches on an already crumbling economy. 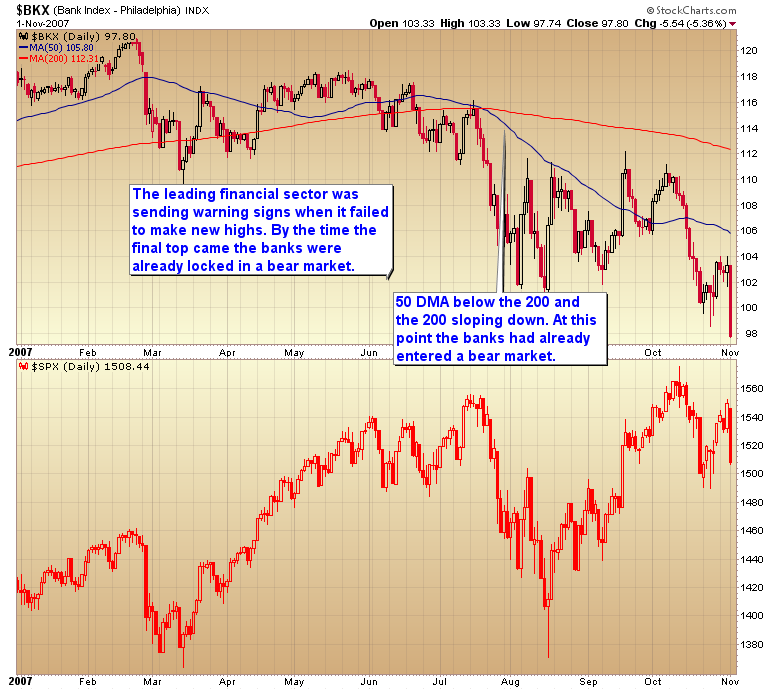 The market gave us a warning when the financials began to diverge from the rest of the market. Considering that the banks were one of the leading sectors during the `02-`07 bull the fact that they couldn’t follow the rest of the market to new highs after the February `07 correction was a big red flag that the bull was on it’s last legs. I’ve been saying for more than a year now that the unintended consequences of QE would be to spike inflation, which in turn would poison the global economy. I knew all along that Ben was never going to create any jobs by printing money and of course he hasn’t. So if inflation is going to sink the economy and kill the stock market we should see warning signs from the sectors most affected by rising inflationary pressures, just like the banks warned us in `07 that the fundamentals were broken. Sure enough I think we are starting to see those warning signs. Emerging markets have been the hit hard by food inflation. We are now seeing food riots in many third world countries. 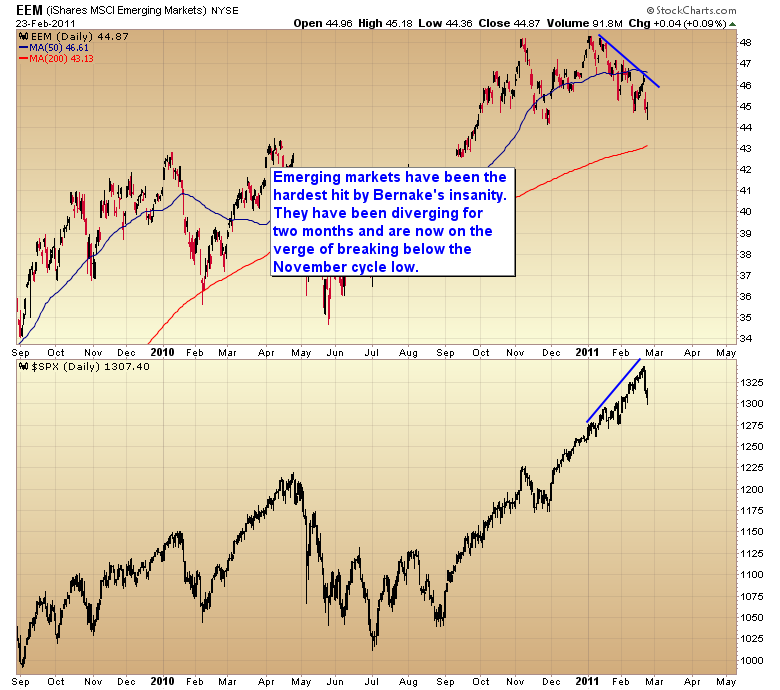 Emerging markets just like financials during the last bull were one of the leading sectors. EEM is now starting to diverge from the rest of the global stock markets. It’s now on the verge of breaking back below the November cycle low. The other sector that is extremely sensitive to inflation are the transports. When energy costs spike shipping companies profit margins are squeezed. The last two days have seen the Dow Transports fold under the pressure of surging oil prices. 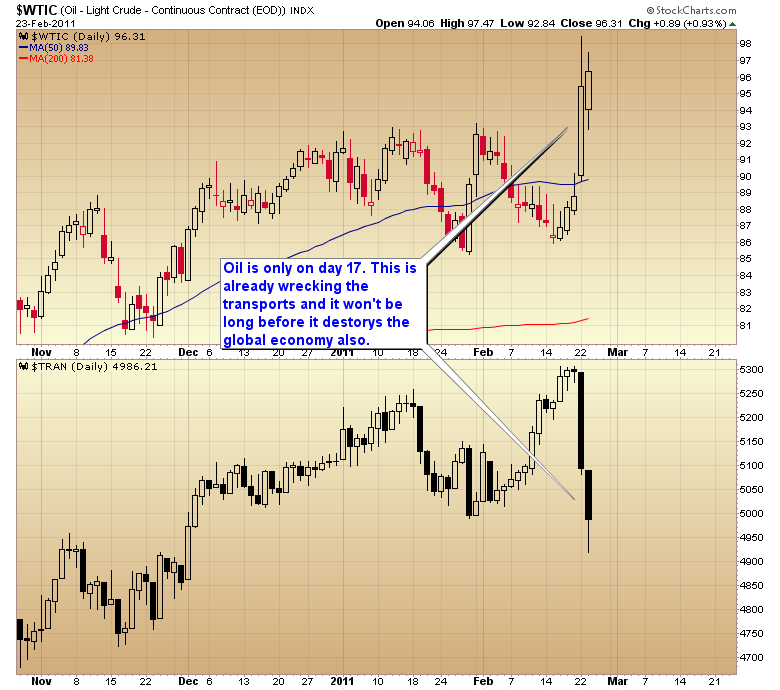 Keep in mind oil is only on the 17th day of it’s intermediate cycle. That cycle lasts on average 50-70 days. I think we are going to see $5.00 gasoline by the time the dollar collapses into it’s three year cycle low later this spring. If the market can recover from the recent correction and make new highs I don’t expect the transports will be able to follow. That will set up a Dow Theory non-confirmation and most bear markets begin with a Dow theory non-confirmation. China is already in a bear market. I think most emerging markets have probably topped and I doubt the rest of the global markets have more than 2 or 3 months left before the next leg down in the secular bear market begins. I think the brief party created by Bernanke’s printing press is about to come to an end. This entry was posted in Uncategorized on February 24, 2011 by Gary. The 15 month & $5 subscription offers will expire at the end of the day. This entry was posted in Uncategorized on February 22, 2011 by Gary. 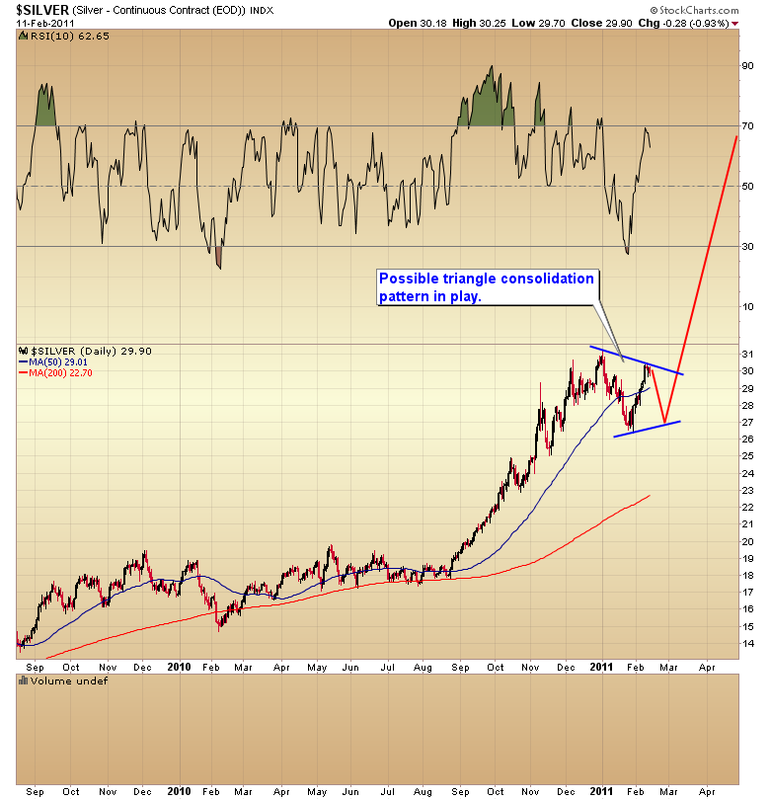 I think we are on the cusp of an amazing run in the precious metals markets. The time to get on board is now before the train completely leaves the station. Starting today I’m going to do a $5 for the rest of February offer. For $5 you will get the nightly reports for the rest of the month and access to all historical reports, COT data & the terminology document. At the beginning of March this will convert to a reoccurring 6 month subscription. This should be long enough to get new subscribers through the rest of the C-wave and possibly through the D-wave this summer. If you decide you don’t want to subscribe for the 6 months just log in to your account, go to the manage subscription page and cancel your subscription any time before the end of the month. Your subscription will stay active till March and then expire without any further billing. To activate the $5 special offer click on the link below and click on the $5 February offer. I will also reactivate the special 15 month subscription for the next few days. In order to view that option you will need to enter the word smtwebinar in the promotional code box and then click continue. This entry was posted in Uncategorized on February 21, 2011 by Gary. If that happens there is little chance the dollar will be able to hold above the March 08 lows as the crash down into the three year cycle low begins in earnest. This will not only drive the final leg up in gold’s huge C-wave it will also drive a huge spike in inflation in all other commodities. Food riots world wide will intensify. The rest of the world will be in an uproar over the collapsing dollar. Spiking commodity prices will collapse discretionary spending just like it did in 08 and 09. The dollar’s rally out of the three year cycle low should correspond with stocks beginning the next leg down in the secular bear market and the next brief deflationary period just like the bounce out of the 08 three year cycle low drove the second leg down in the secular bear market. The rally out of a three year cycle low usually lasts about a year to a year and a half. 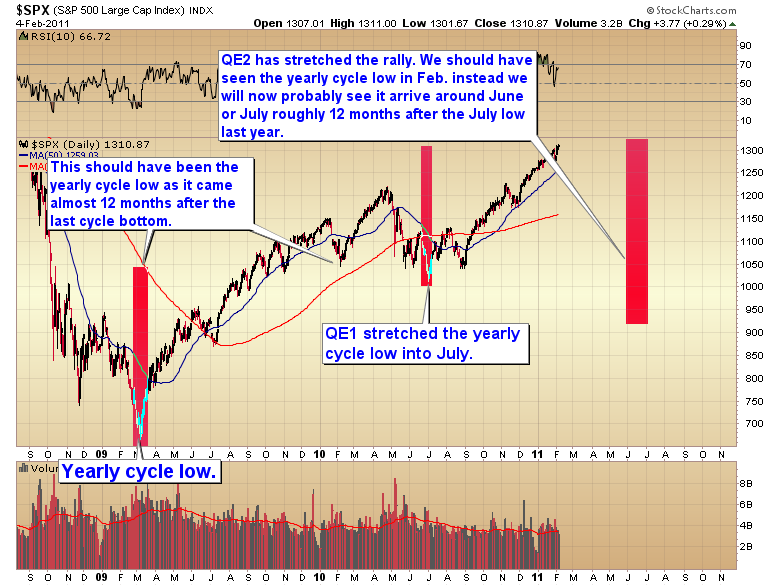 The next 4 year cycle low in the stock market is due in 2012. 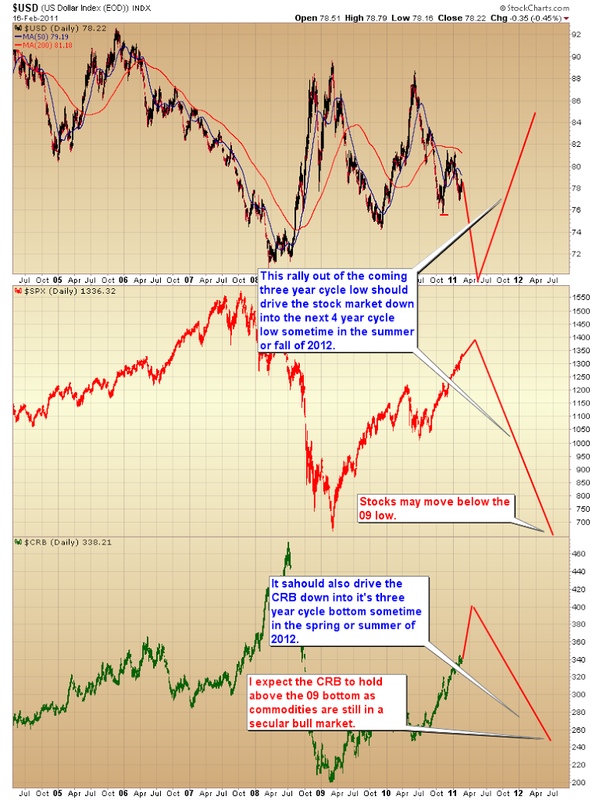 I expect that year long rally out of the coming three year cycle bottom to drive stocks down into the next major 4 year cycle trough and drive the CRB into it’s next major cycle bottom. A lot is riding on the next 2/3 weeks. If the swing high in the dollar yesterday does signal the top of the dollar’s daily cycle then the November low will almost surely be broken and the chain of events I laid out will be set in motion. This entry was posted in Uncategorized on February 17, 2011 by Gary. This entry was posted in Uncategorized on February 15, 2011 by Gary. I’ve pointed out in the past how consolidation size is usually predictive of how large a move will be once a breakout occurs. I thought I would take a quick look at the silver bull today using that criteria. As most people know I’m mostly interested in silver during this bull market. I really doubt that I will ever buy another oz. of gold again. 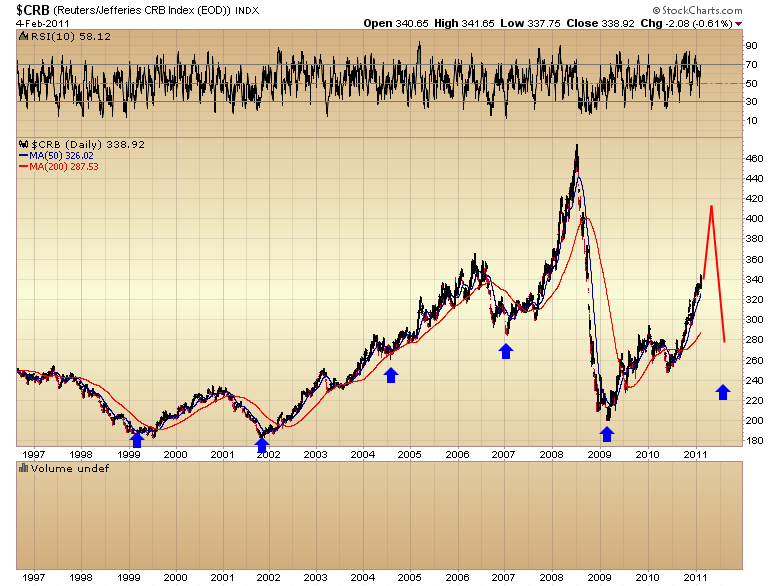 So let’s start by taking a look at the long term chart of silver. As you can see the consolidation principle works perfectly in the silver market. So far we’ve had three major consolidations and each one as been followed by a powerful rally driven by the size of the preceding consolidation. The relevant fact is that the longest consolidation has also produced the biggest breakout. If that continues to hold (and I think it will) then the current rally is probably only half over. A meager 46% breakout is way too small for a 30 month consolidation. If I had to guess I would say silver might be in the process of forming a triangle consolidation pattern, especially if gold has one more drop down into a final intermediate cycle low. Ultimately I expect this breakout to launch silver to somewhere between $43 and $50 before the next consolidation phase begins. This entry was posted in Uncategorized on February 13, 2011 by Gary. While I don’t think gold is likely to head back down and make a lower low I’m going to lay out a simple strategy to protect against getting caught in case it does. 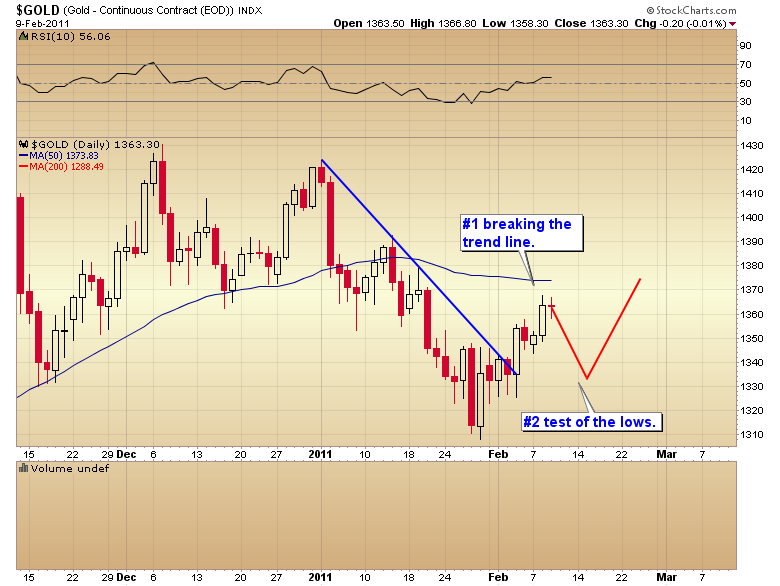 It appears likely that we may see our first reaction against the new uptrend. This is the #2 test of the lows in a 1-2-3 reversal. If gold then reverses and breaks through the pivot it will complete the 1-2-3 reversal and it will have begun a pattern of higher highs and higher lows. That would be the signal that the down trend has been broken and one could add in full positions or leverage (don’t get carried away) as they see fit. The downside is of course one will lose some profit potential waiting for confirmation and if gold reverses the early morning weakness you will just have to immediately buy back. The action would be to lock in some profits this morning and then wait for the pattern of higher highs and higher lows to complete before putting positions back on. This entry was posted in Uncategorized on February 10, 2011 by Gary. This entry was posted in Uncategorized on February 7, 2011 by Gary. It has been my contention all along that the Fed would print until something breaks. Once that break occurs we will enter the next leg down in the secular bear market. This time I don’t expect it to be the credit markets, although we will almost certainly have trouble in the municipal and state bond markets. Some may even default. I actually think the greater risk is from massive layoffs by state and local governments in an effort to cut expenses and avoid default. When that begins we will see unemployment levels start to spike again. The real danger is going to come from inflationary pressures unleashed by the Fed’s QE programs. We are already starting to see severe inflationary pressures in food and energy and it’s already causing social unrest in many third world countries. Expect this to continue and intensify as we move into the summer months. Besides starting an inflationary spiral QE is also stretching the stock market cycles. To explain; The `09 yearly cycle low occurred in March. The 2010 yearly cycle low should have arrived in the early spring roughly 12 months after the March `09 bottom. We did have a decent correction in early February. That should have marked the yearly cycle low. However, because of QE1 that cycle stretched into July, and was more severe that it should have been absent Fed meddling. We even witnessed another mini-crash. A direct result of the extreme complacency generated by the QE driven rally in March and April. Under normal conditions the cycles would adjust and we would get a shortened cycle this year that should have bottomed right about now. Obviously that isn’t going to happen since we don’t even have a top yet. It’s now clear that QE2 is going to stretch this cycle also. I now look for the next intermediate bottom to arrive this summer sometime around July (roughly 12 months after the 2010 bottom). 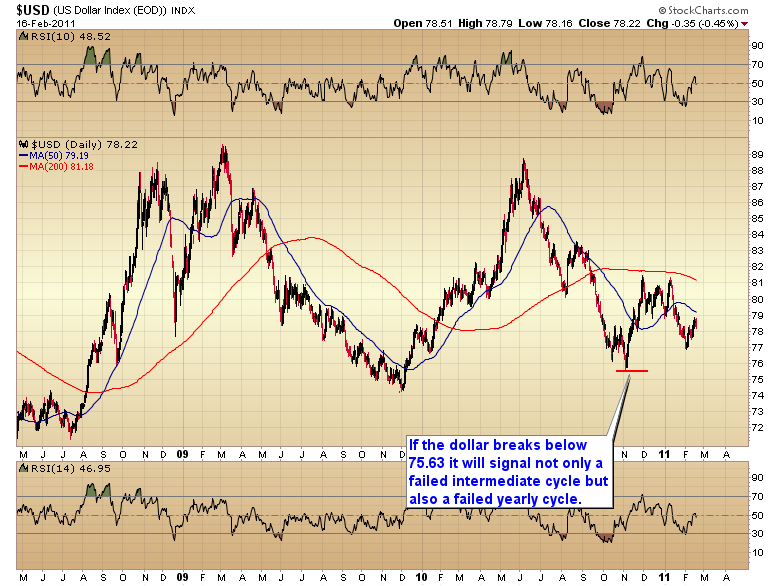 This should correspond with the violent rally as the dollar blasts out of the three year cycle low. This should mark the beginning of the next leg down in the secular bear market. 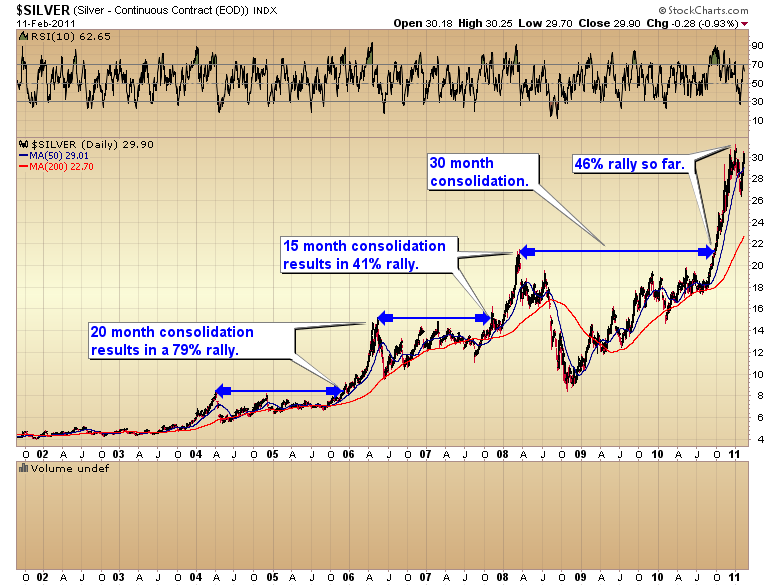 Confirmation will come if the correction is severe enough to test the July 2010 lows. In a healthy bull market each intermediate correction should bottom well above the prior low (higher highs and higher lows). 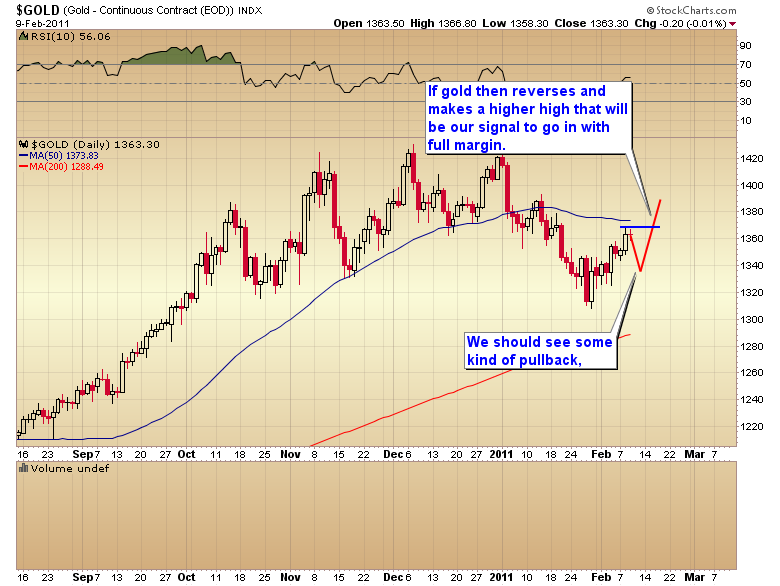 A move down to the 1050-1000 level will be a clear sign the bull is in trouble. We should also see the dollar rally out of the three year cycle low force the CRB down into it’s 3 year cycle low (actually the cycle runs about 2 1/2 years on average). Even though I have been expecting the market to correct (into the normal yearly cycle timing band) I’ve been warning subscribers not to short the market because the dollar is dropping down into a major cycle low. There was always the possibility the dollar collapse would stretch the cycles and make selling short very risky. The time to short will come once the dollar puts in the three year cycle low and all markets begin the move down into the timing band for the next yearly cycle low this summer. Until that time its still too early to play the short side. 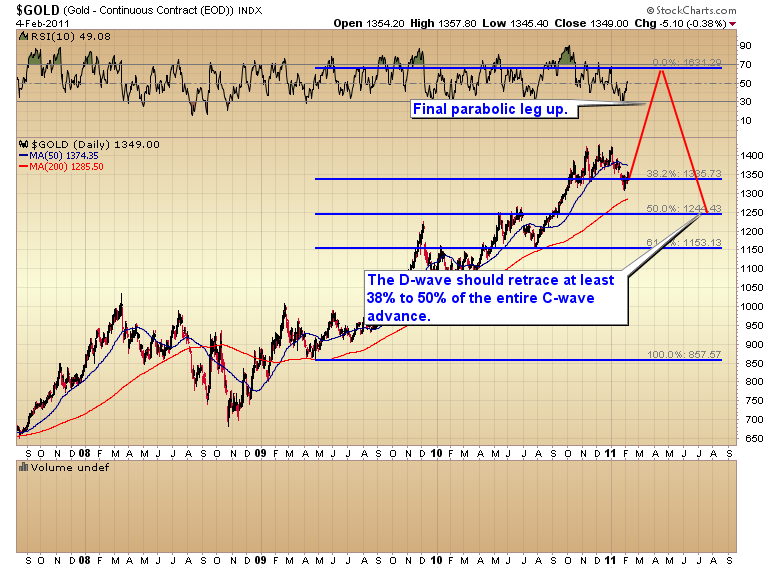 The odds are better positioning for the final leg up in gold’s massive C-wave advance. This entry was posted in Uncategorized on February 6, 2011 by Gary.